The research group of Dr. Hiroyuki Matsumoto at the Japan Agency for Marine-Earth Science and Technology (JAMSTEC) have demonstrated that a pressure standard*1 is capable of reproducing pressure fluctuations similar to those observed on the seafloor. In addition, since the bottom pressure recorders (BPRs) used in a laboratory experiment during an earthquake did not record incident seismic waves, it is suggested that the measurements of the in situ BPRs are true underwater pressure measurements. On November 16, 2017 at 09:43 UTC (18:43 JST), an earthquake with a magnitude of 5.8 occurred off the east of Hachijo Island. in situ recordings were obtained by BPRs and broadband seismometers installed by JAMSTEC as part of a long-term borehole monitoring system*2 in the Nankai Trough. 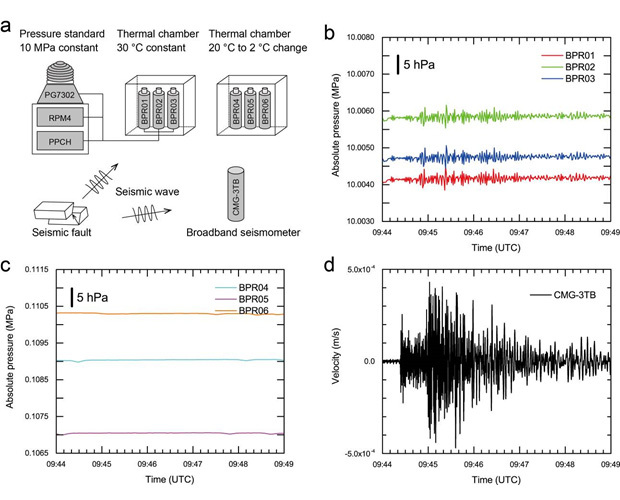 The JAMSTEC research group has carried out a laboratory experiment with three BPRs connected to the pressure standard during the earthquake, which provided the first opportunity to compare in situ data with laboratory pressure measurements. Various features of pressure fluctuation and ground motion were comparable between the laboratory experiment and the in situ observation. The pressure fluctuation recorded by BPRs during an earthquake follows the acceleration that forces the water mass above the BPRs. 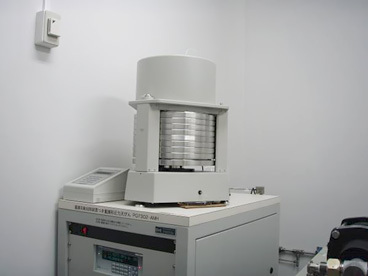 Additionally, it was also observed that a BPR in the laboratory that was not connected to the pressure standard did not record any vibrations induced by seismic waves during the earthquake. Data from BPRs installed in the seismogenic zone in Japan are used for tsunami warning, so the findings presented herein could improve the use of such data for tsunami warning systems. This study was supported by JSPS KAKENHI Grant Numbers JP16K01323 and JP16KK0155. The above results were published in Scientific Reports on November 6, 2018 (JST). A pressure standard is an instrument consisting of a piston-cylinder module and a dead weight. It is capable of producing high-precision pressure conditions. The piston with the dead weight loaded by a downward gravitational force is balanced with an upward pressure within an appropriately positioned cylinder generating high-precision pressure within the piston. The generated pressure can be adjusted by changing the combination of the dead weight and the piston-cylinder module. A long-term monitoring system for boreholes was developed to conduct high-sensitivity sub-seafloor observations for events such as earthquakes and diastrophism. 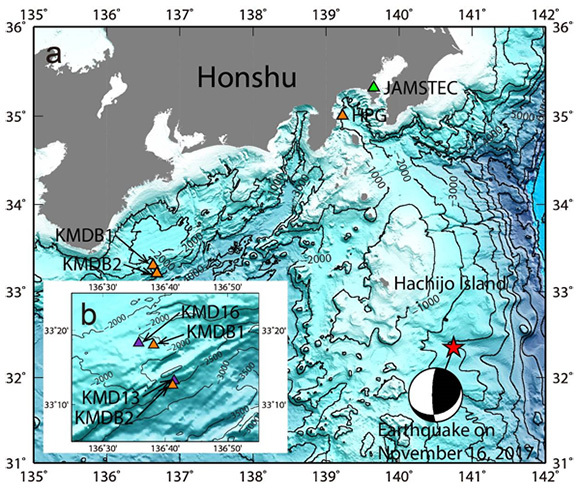 In the Nankai Trough, the system has been installed at three locations (only two at the time of this study) in boreholes drilled by JAMSTEC’s scientific drilling vessel, Chikyu. Real-time Observation data are transmitted to monitoring stations through the Dense Ocean-floor Network system for Earthquakes and Tsunamis (DONET). The epicenter of the earthquake occurred off the east of Hachijo Island on November 16, 2017 (red star in the figure). The long-term borehole monitoring system (LTBMS) installed in the Nankai Trough is shown as orange triangles: KMDB1 and KMDB2. A beach ball with black and white colors shown at the epicenter represents the earthquake source mechanism. During the same time, a laboratory experiment was being conducted at the site denoted by the green triangle on the map. HPG represents the deep seafloor observatory off Hatsushima, where a BPR is installed at a water depth close to the applied pressure in the laboratory experiment. a) Magnified view of the area near the LTBMS. KMD16 and KMD13 (purple triangles) are seismic observatories of DONET, with seismic sensors on the seafloor. 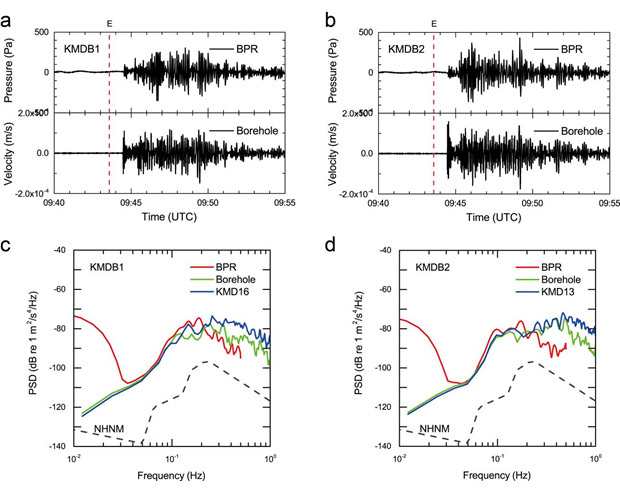 a) Waveform recorded by a BPR (top) and waveform recorded by a borehole seismometer (bottom) at LTBMS of KMDB1 when an earthquake occurred. The vertical red dashed line represents the time at which the earthquake occurred. b) Waveform at LTBMS of KMDB2 with the same form as (a). c) Comparison of the spectrum (frequency component) for ground motion and pressure fluctuation at LTBMS of KMDB1 during the earthquake. The red line represents BPR, while the green and blue lines represent the borehole seismometer (Borehole) and the seafloor seismometer (KMD16), respectively. The pressure fluctuation follows the ground motion in the central frequency range shown in the figure. The dashed line in the figure (NHNM) represents the upper limit of a noise level obtained by analyzing global broadband seismometer recordings. d) Comparison of the spectrum (frequency component) of the pressure fluctuation with the ground motion at the LTBMS of KMDB2 at the time of the earthquake. Overall the features are same to the panel c). a) Overview of the laboratory experiment with in situ sensors examined by JAMSTEC. When an earthquake occurred, three BPRs (BPR01–BPR03) were set within a thermal chamber at 30 °C and connected to the pressure standard, and a pressure of 10 MPa was applied. Three other BPRs (BPR04–BPR06) were set in a thermal chamber in an ambient environment undergoing a thermal change from 20°C to 2°C. An evaluation test for a broadband seismometer (CMG-3TB) was also underway. b) Waveform of BPRs to which a pressure of 10 MPa was being applied from the pressure standard when the earthquake occurred. The pressure fluctuations observed were due to to the oscillation of the pressure standard during the earthquake, and not to the direct measurement of seismic waves by the BPR (see also c) for the counter-example of BPRs not connected to the pressure standard). c) Waveform of unpressurized BPRs when the earthquake occurred. Pressure fluctuations were not observed in this case. BPRs 04-06 were not connected to the pressure standard device. d) Waveform of a broadband seismometer proving that there was ground motion at JAMSTEC induced by the earthquake, i.e. the six BPRs were shaken by the seismic motion. a) Comparison of spectra of BPRs and seismometer. Pressure is converted to acceleration. The spectra from the three pressurized BPRs (BPR01 - BPR03) show that the BPRs recorded virtually the same pressure fluctuation. The spectra of three pressurized BPRs follow the spectrum of the seismometer. 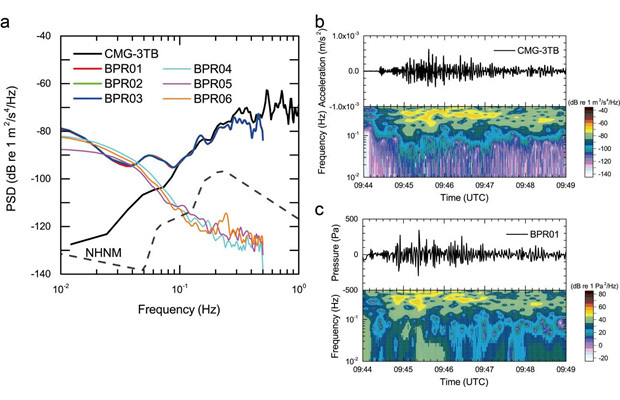 In contrast, the spectra of the three unpressurized BPRs (BPR04–BPR06) that measure barometric pressure do not follow the spectrum from the seismometer. b) Spectrogram of the seismometer. The figure shows the frequency spectrum as a function of seismometer data time-stamps. c) Spectrogram of a BPR (BPR01) with applied pressure of 10 MPa. The figure also shows frequency change as a function of BPR data timestamps. There is a good agreement in the frequency patterns between the seismometer and the BPR. a) Comparison of pressure fluctuations observed by the BPR at the deep sea observatory off Hatsushima (HPG) and the BPR connected to the pressure standard (BPR01) in the laboratory. While the waveform recorded at HPG slopes downward to the right because it records the tide, the waveform by BPR01 slopes upward to the right because it records barometric pressure. b) Comparison of both spectra. The BPR off Hatsushima is installed at a water depth of 1,176 m, while a pressure of 10 MPa is added to the laboratory BPR. Therefore, pressure is normalized by the water depth and converted to acceleration in order to take the difference of the water depth (applied pressure) into account. Note: The pressure of 10 MPa was chosen to approximate the hydrostatic pressure at the depth of 1,176 m.